I don’t often teach beginners kendo classes. In both dojo that I frequent there are a number of people who do a very good job of getting people started. I usually only run the sessions for more experienced kenshi, which frankly is less difficult than taking people from zero to a level where they can join the main group. Those of us who have been training for a while have shared terms of reference, so that although it might be hard to change ingrained habits, we at least are aware of what we should do to achieve change. The instructor’s job is one of reminding people what to work on. With beginners the instructor is laying the foundations for their future kendo lives. With this in mind, I recently took on a six week beginner course at Sanshukan, my local dojo. I am now three weeks in to what can be no more than a “taster” programme with 16 keen new kendoka of various shapes, sizes, ages and levels of physical ability. My challenge is to create an interesting experience for them, while at the same time trying to build a correct base which avoids creating habits that will have to be unlearned in the future. In the past in Japan, the solution would probably have been to force them to spend a year practicing suburi in a corner of the dojo before grading them shodan. In the UK in 2015, we have as much an obligation to keep everyone engaged as we do to foster good kendo basics. My first surprise with our new intake was that with the exception of one student, who tried kendo briefly in Japan, no one in the group had actually seen kendo. To remedy this, on week one I called on senior members of different ages to demonstrate what we are aiming for. This seemed to make most people more interested, although we lost 2 whose expectations may have been more Ninja Turtle than FIK. Since then I have been trying to provide a balance of education and entertainment. Of course we have been involved in the serious business of drilling on kamae, footwork, posture, correct cutting and tenouchi etc. Suburi plays an important part, but It is very difficult for a first-timer to judge the sharpness of a strike just by cutting air, so they are also hitting uchikomi-bo and shinai. I have also persuaded some of the seniors to put on their bogu and be used as targets for attacks made with differing levels of control. A number of the newbies have expressed their enjoyment in hitting real people. We ran a mid-term customer satisfaction survey and people who did not drop out on week one seem to still be engaged . They also appear to be picking up some rudimentary kendo skills. Whether anyone will stick at it once motodachi start hitting back is is anybody’s guess. The kendo year is now in full swing and I have a number of kendo travel commitments already booked. Whilst I am looking forward to them all, I know that each of them will provide the challenge of how not to spend as much on transporting shinai as they cost in the first place. 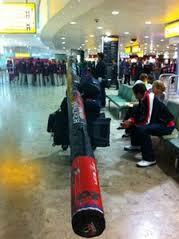 In Europe I usually get round the sports equipment charge that most Airlines impose by borrowing shinai from my hosts. When I went to Brussels earlier this month I came up with the cunning approach of sending my shinai and bogu in a friend’s car while I took the plane. I am going to Japan next week for the 16WKC Referee Seminar. The plan is to travel with an empty shinai bag and buy some shinai there with the hope of persuading the nice Japanese ground crew that they should bend the rules to further the international development of one of Japan’s key cultural pursuits. I have whined about this before and readers have come back to me with a number of tips to get around the problem. I have been advised to tape the shinai bag to my suitcase, use a combined ski and clothing case, try a golf or ice hockey bag and a range of other creative approaches to luggage. Frankly I am too old and too small to pretend that I am an itinerant ice-hockey pro. I like the feeling of travelling in my own skin, as a tourist with my bogu inside a normal suitcase and with an added shinai bag. I met Kumi Sato last year at Copenhagen Airport and she had successfully managed to take her shinai on board as hand luggage on a flight from Stockholm. This was probably helped by the fact that her two shinai were in a brightly coloured polka-dot shinai bag. Readers in the UK will get the picture if I mention Mr Blobby. The fact that she was allowed to take them on board may have been a part of the drive by European airlines to allow bigger hand luggage to cut baggage handling costs and I am seriously considering exploring this approach. Nevertheless, I have the feeling that Kumi’s more playful shinai bukuro may have stood a better chance of getting on the plane than the usual bag with its austere martial arts kanji. Can anyone lend me a Hello Kitty shinai bag? It’s been a while since I last wrote about shinai, but having suffered the loss of three of my favourites in as many weeks, I feel like writing an obituary for them. As I may have mentioned before, I am a sucker for expensive shinai; preferably koto style with a medium sized grip. I used to go for fat handles but I have converted, believing that I get better mobility and tenouchi if my fingers are not overextended. My eyes immediately light up when I see madake on the shinai description. Colleagues argue that like Musashi, one should be able to use any shinai or bokken, boat oars included, and that we should follow his advice of “use a heavy sword lightly and a light sword heavily”. Unfortunately I am not Musashi, so I am stuck with my own prejudices and preferences. The one discovery that I have made is that no matter how high the price tag, shinai can break at any time. There are the obvious accidents, which happen in slow motion like car crashes, as you watch the shinai bend like a banana and then snap as a heavyweight opponent comes charging onto the point. 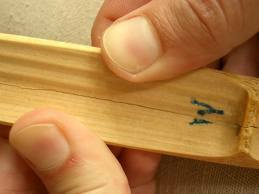 There are the less satisfying stealth breakages where you find a hairline crack when you examine your shinai after keiko. With these you always start optimistically imagining that it’s just a surface wound that can be rescued with sandpaper until you look at the inside of the take and realise that the skin wound is a terminal fracture. I have on several occasions seen a crack running through the centre of the bottom take above the nakayui. In this case it seems worth losing the shinai for this concrete confirmation that I am hitting with the datotsubu. So there must be some preventative medicine for shinai. I have tried oiling them, soaking them, seasoning them, keeping them inside and outside and they still break when they decide to. I do none of these now and it has not changed the life expectancy of my shinai. If you however you are a fan of lubrication, please remember to wipe the shinai before keiko. I still have some waxy stripes on my nice new deerskin men and kote which could have been avoided. Of course there is also the good old Frankenshinai option. Although experience tells me that on average these last for one practice, optimism has triumphed and I have just married the remains of two identical shinai and plan to use the result in my next keiko. I will let you know how I get on, but don’t hold your breath. Despite my regular attempts to grab attention with ironic references to kendo as “stick fighting” or as a sport, I firmly believe that it is a shugyo, a Zen martial art based on Taoist and Confucian philosophy, developed with the aim of developing the human character. As such reiho , the physical display of courtesy is an integral element. In Kendo, a Comprehensive Guide I devoted much of the book to the description of reiho and chakuso and still only scratched the surface, Your remarks on my last post prompted this attempt to describe some of the aspects of reiho in slightly more detail. Reiho can be easily categorised into the obvious and the kendo specific. The obvious includes the things that we would consider polite behaviour in most societies. For instance don’t chat when an instructor is talking”, or “don’t slouch or lean on on walls in class” are instructions given to school children around the world. As a child, I was told to ask permission when I wanted to leave the dinner table. In the same way you should do so when you need to leave the dojo, not just for the sake of politeness, but so that those running the session can keep track of you, if for instance you became unwell. I could continue with this list but there is little value in describing the obvious. Instead I have tried to list some of the points that are specific to kendo or budo. Rei – This used to be a lot more complicated, as anyone who has watched elderly Japanese ladies striving to hit the correct angle for the exact social circumstance might realise. Now in kendo we bow to each other at an angle of 15 degrees from the waist keeping the back straight. The key thing is to make eye contact and then continue it throughout the bow. 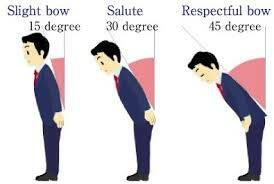 At the dojo entrance and to our instructors we bow to 30 degrees. For zarei we form a triangle between our two hands and lower our forehead directly above it keeping the back street. You should exhale as you bow. Sonkyo – This salutation is unique to kendo and sumo. Ensure that after rei you come to correct distance and then bring your shinai over and down to chudan using the most direct path as you drop into sonkyo. When you finish your keiko or tachiai you reverse the process, ensuring that you put your right hand on your right thigh as you return the shinai to your hip. This signifies that you have no further intention of drawing your sword, but that you are able to do so if your opponent breaks the peace. Entering shiai jo – you can take as many steps as you like before you bow, but bow correctly and take only three steps to the kaeshi sen and sonkyo. Shinai – Kendo is “The way of the sword” and the shinai symbolises the razor sharp katana. We should not walk over other people’s shinai or touch the jinbu of their or our weapons. We should not use the shinai as a walking stick nor drag the point across the floor and we should not bang it on the floor to signal yame. Hakama – After my last post someone commented on one of the Facebook groups that he has seen hundreds of ways of wearing hakama. I personally believe that there are only two ways – right and wrong. The hakama invokes the spirit of budo with pleats representing the Confucian values “gin,gi,rei, chi, shin – makoto” (benevolence, justice, courtesy, wisdom, faith and sincerity). The left leg goes in first and comes out last. The waistband should be level with the navel. The ties should cross under the tanden. The koshiita should sit above the ties at the back. The hem of the hakama should clear the toes and slant upwards from front to rear. Kote – like the legs of the hakama, these go on left right and come off right left. Reasons given are that it left the right hand free to draw the sword or to draw a bow string when under attack. Tenegui – folded inside or draped outside the men for rei, customs vary from dojo to dojo, but however you do it, keep them freshly laundered and contemplate their meaning before you put them on. Kiai and kakegoe – should be short and sharp; it should not sound as if you are bragging about the point you just made. Sempai and kohai – Unless we are part of the Japanese system, we will never fully understand the structure and obligation of these relationships. Dojo etiquette however should however be based on mutual respect. Feel free to cross the dojo to make zarei to your teacher, or even to tidy and pack his or her bogu, but only do so as a genuine token of respect. These are just a few examples of the way we should behave in the dojo. To make a comprehensive list would be a major undertaking. I hoped to give more explanations of “why” we do things and over the years have asked a number of sensei about some of background to kendo reigi.In most cases the answer is “because that is what we do”. Perhaps one more point of reigi is that we should show the tact and politeness to accept the “sonno mama” (way it is) of kendo. I am down to my last two shinai. One is a beautiful handmade Japanese madake koto shinai, that thanks to the ever rising yen is worth an average European weekly wage and the other an interesting piece of kit with Japanese madake written in kanji on the tsuka, and made in China inscribed in English on the take. This unfortunately is now bent like a banana and now of little use for anything other than hitting around corners. I did acquire a standby from the dojo cupboard, but this has a koban handle and somehow seems like half a shinai, in that it only works in one direction. Within two minutes of removing the string rings, it collapsed inwards after receiving its first kirikaeshi, so I do not think that it is going to provide a permanent solution to my shinai needs. I have two of Chiba sensei’s shinai stashed in the spare room against his future visits and the devil on one shoulder keeps telling me that it would not hurt to borrow them. The angel on the other shoulder however, reminds me that it would be wrong to do so, and that my using such a meijin’s shinai would approximate giving a Stradivarius violin to a chimpanzee. In the middle of this quandary the manager of the Linkedin kendo group asked about the pros and cons of using carbon fibre shinai. Clearly carbon fibre is hard wearing and long lasting, but I still have an aversion to shinai made of this material. Their feel and the sound they make when striking a target is very different to that of their bamboo counterparts and when I used one briefly in the past, I sustained elbow injuries. This is not an uncommon experience, and there are numerous reports of golfers elbow sustained through their use. I have also heard of cases of damage caused to bogu and impact injuries to people hit with them, but these reports may or may not be urban myths. I was given a carbon fibre many years ago, and its use moved rapidly from keiko, to receiving uchikomi and I then gave it away. There are numerous fans of carbon fibre shinai. Many German kendoka use them as their weapon of choice. This may be because of the influence of the late Ando sensei who used them and other products made by their manufacturer. 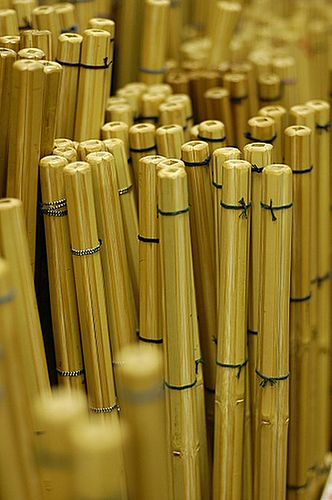 Nevertheless my own preference is for bamboo, so when I make my trip to Japan next week, I will be taking an empty shinai bag and a pile of yen. Summerlin interestingly commented on my last post that shinai tsuka have changed over time and that this may have an effect on the way that we learn tenouchi. This could certainly be a contributing factor. I am a firm believer that kendo is subject to fashion and change. In the eighties and early 90s we saw bogu with brightly coloured kazari; the rule now is the plainer the better. Equally, over time there have been various changes to tsuka and tsukagawa. I am not thinking of the recent snazzy additions of coloured trim or dragonflies on the nigiri, but of physical changes to size and shape. Whilst the overall dimensions of shinai have not changed since the mid 1800’s, there seems to have been considerably variation on the length of tsukagawa and the percentage of the shinai that it covers. IKF regulations are stringent about the length and weight of shinai. There are also strict specifications for the diameter and length of sakigawa, but to the best of my knowledge no rules apply for the length and diameter of the tsuka. The only limiting factor being that the tsuba must rest on the bottom edge and not leave a gap between the tsuba and the bottom of the tsukagawa. Looking at videos of pre-war kendo, tsuka appeared to be longer than those used now. I have also seen shinai from the 1970s where tsukagawa had obviously more length than their modern counterparts. In the 90s we went into a period when shorter was better. 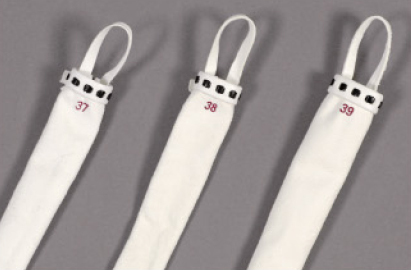 Most of my kendo friends in Japan were specifying 38 tsukagawa on 39 shinai. More recently we have seen a trend for shinai to be made with much bigger diameter handles, many of these coming from Chinese manufacturers for export to the west. Whilst I see the logic in buying shinai that fit your grip in much the same way as would a tennis racquet or golf club, some have reached a point where it is impossible to close an average sized hand around them. In my view this is overkill; you should have sufficient space to manoeuvre the shinai within your hand to correctly execute technique. What has not changed is the guideline for measuring suitable tsuka to fit your own needs. You should place the tskuka of the shinai so that the tsukagashira rests in the crook of your right arm. You should then grip the upper end of the tsuka loosely with your right hand and your first finger should fit just below the tsuba. If you are buying a new shinai and you have the luxury of choosing a tsukagawa to fit, you should have no problems. On the other hand if you have used a tsukagawa for a while it may have stretched. In this case you have to shorten it. There are two kinds of tsukagawa – toko and gin (gintoki). Toko is the cheaper kind and can normally be shortened by folding back the leather at the open end and making new holes for the leather thong that attaches to the tsuru. Gin tsukagawa are normally threaded at the tsuba end with a leather thong so they need to be cut at the closed tsukagashira end, and be sewn in a circle whilst turned inside out. I admit that I am a sucker for expensive shinai – ideally koto style madake with a thick handle to fit my hand. There is however no guarantee that these last longer than their cheaper cousins and although unusual, I have had the fun of breaking a 7,000 Yen shinai on its first outing. O.K I appreciate that more expensive bamboo grown in northern climates is denser and more likely to last, but I still break them. I am not a shinai snob however and have been really impressed with some of the more recent Chinese exports. It is just that whenever I pick out shinai at random from the bin in the bogu shop my favourite always seems to have the biggest price tag. My taste in shinai is now pretty much fixed. I have tried dobari, chubu, oval koban and even heaven forbid, carbon fibre shinai in my time and I simply prefer koto shinai with the balance in the middle and a handle that is thick enough to grip. I do not get the rationale that dobari shinai make it easier to do suriage waza etc. My favourite technique is suriage men and a koto works perfectly well. Koban are, I suppose, useful if you are in the habit of turning your shinai round in keiko, but beyond that I really cannot see the point. Carbon fibre shinai do, I am sure, have a use. If you are on a kendo mission to an inaccessible part of the world and your next shinai replacement mule train is 6 months away, then by all means take one with you. I am afraid that with the help of a drill and a ball of string, my only ever carbon shinai became four really useful, shinai bag size keikogi hangers. Before I set off in my normal stream of consciousness fashion to write this, I thought I should do a quick web search to see what other people had to say. Weirdly there were a number of posts on “how to make your own shinai. Having now seen two professional demonstrations on shinai manufacture, (both at the Kyoto Taikai), I would not recommend this DIY approach. I like many people, believed that take were made to fit together by cutting and shaping, where in fact the shinai craftsmen take big fat pieces of bamboo, heat them over a hibachi and compress them using wooden tools. The only cutting is the final trim before assembly. I imagine that there are production line versions of this process and not all shinai are made by a nice old man with a charcoal brazier and a wooden monkey wrench. Understanding the effect of heat on bamboo, it is easy to see why shinai left in the car boot in summer sometimes come out looking like bananas. The most important issue with shinai is maintenance for safety, so anyone with a conscience should make a regular habit of checking for and removing splinters, ensuring that the sakigawa is sound and that the tsuru and nakayui are tight. After that my wisdom on maintenance starts to fade. I have tried oiling, spraying, soaking in oil, waxing and leaving them alone and in my view, the last option seems about as good as good as any. One trick though, that is worth doing, is if you are importing your shinai from another country, buy them in advance and let them adjust to the climate for 6 months or so before you use them. Finally, reflecting on the advice to buy shinai two at a time from the same supplier, so that you can replace broken take with similar sized spars – forget it. That is unless you are a master woodworker! Having built numerous “Frankenstein shinai”, I cannot justify the return on investment, an hour or so’s shaping, trimming and sanding and they always break first practice. Here’s a pic of four of my favourite shinai two are expensive Japanese madake and two economy Chinese versions. Any guesses which are which?